Menus and navigation deserve a lot more than a brief mention in a chapter. There’s a ton of user interface design and usability to discuss; there are the considerations regarding; and there’s the ever-raging argument over horizontal versus vertical menus. Still, these are all non-PHP issues. For you, PHP programmer extraordinaire, the concern is building out links and options that change based upon whether a user is logged in. // show options for logged in users. 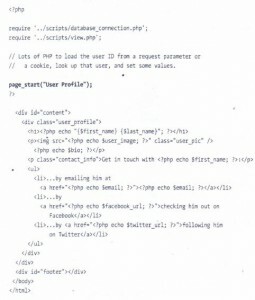 Go back to view.php which is where all the code that controls the header of your page resides. Having some of your core view code tucked away in scripts that the rest of your pages can reference makes a huge difference. The display_title function handles the first bits of a displayable page right now. There’s a twofold beauty to this. First. this menu is now available to all scripts via few on». This means that you don’t need to go rooting through all your files and insert new HTML and if statements to get a site-wide menu. Second, because you dropped this code into dispIay _title, any of your scripts that already call display _title automatically get the menu code. Nothing to change in those at all. 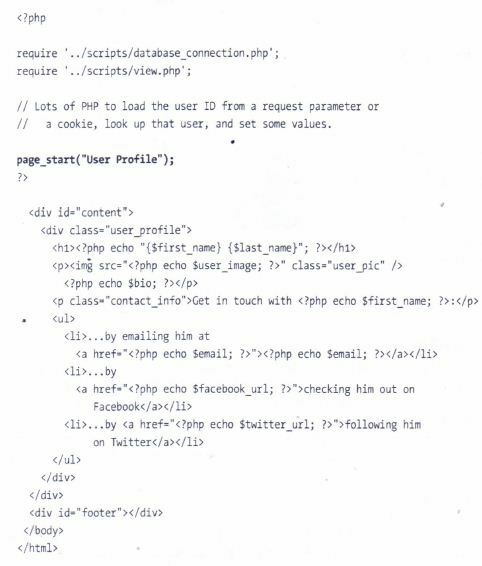 You’re not worried about passing a user’s ID into show_user.php because there’s a cookie set. and you’ve already seen that show_user.php is happy to grab that value through $_ REQUEST'[user _id’ ]. just as though you’d explicitly passed in a user ID through a request parameter. largely never touched. Most Internet users are not very security conscious, and there’s also an expectation that a website will simply remember them when they return later. Signing out would prevent that, so why do it? There are good reasons to add Sign-out capabilities to any app. First, if users are accessing your app on a public computer or shared laptop, you want to ensure that they can protect their credentials by signing out Defy letting anyone else use the computer. Second, just because most users aren’t security conscious doesn’t mean that none are. Give someone the option to sign out. and if he doesn’t avail himself of it. no big deal. If he does, he’ll be glad your app gives him that control. And last but not least, you know how to create cookies. It would be a good thing to know how to delete them, as well. Thus, adding a sign-out link forces you to get a handle on that. too. Now; sign in. 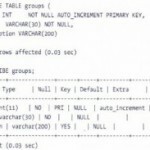 You should automatically land on show_user.php and see something like Figure 13-10. There’s a nice. 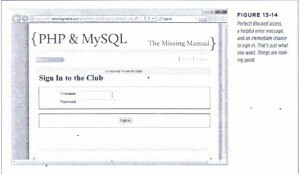 simple menu on the right that appears, thanks to start _page. 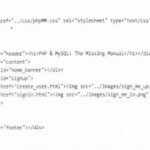 display, title view.php and the cookies you set in signin.php. You might have noticed that even once you’ve fixed up show_user.php, show_users.php and signin.php there are still HTML web pages left in your application. 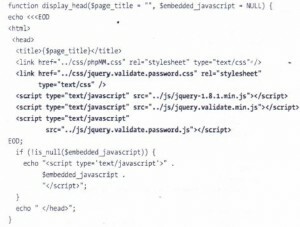 There’s index.html the initial page, as well as create_user.html. But, these pages don’t get the benefit of start_page and view.php, because they’re HTML, not PHP. 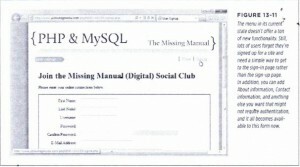 For index.html that probably makes sense. The only two places you want users to go is the sign-in page or the sign-up page; both are clearly accessible through those big green buttons. However, that’s not the case with Create_user.html Suppose that someone clicks through to that form and then wants to return to the main page. Or, more likely, she might want to sign in rather than sign up. 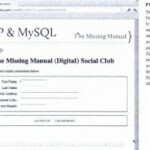 This becomes even more the case as you add other options to the menu, such as an About page. 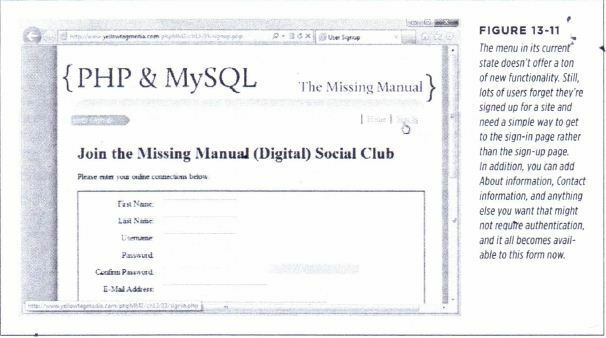 Clearly, create_user.html needs that menu. 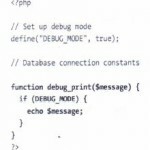 In essence, all you have to do is convert Create_user.html to PHP. 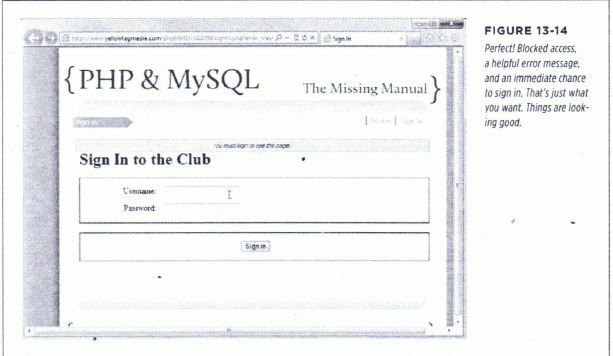 You could call it create_user.php apart from the fact that create_user.html already exists. So, as a starting point. rename create_user.html After all, it’s a form for signing up users, and the name doesn’t clash with any other file names. Yourloqin now works, but don’t forget to add logging out. Whether you set your cookie’s expiration value to a short few minutes or a long one, always let users control their own authentication. They should be able to log in and log out when they want. 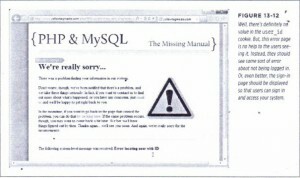 Fortunately, the issue of error pages showing up at the wrong time isn’t hard to fix. 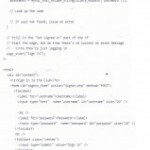 Earlier, show_user.php and other restricted scripts required authorize.php (page 396), which did all sorts of database work to determine whether a user could log in, all using basic HTTP authentication. 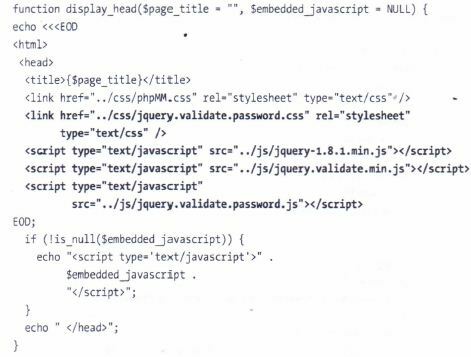 As a result, you got a nice wall around your scripts. 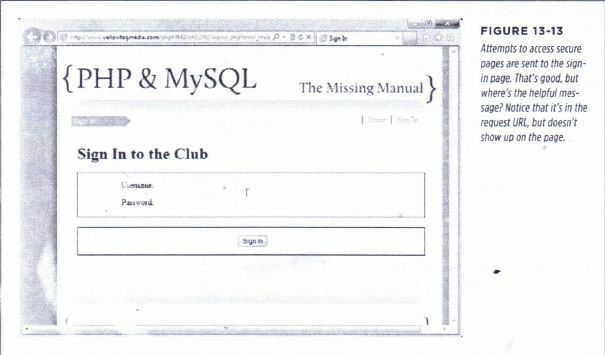 By removing authorize.php it became possible to have signin.php handle logins. In the process, though, you knocked down that wall around your other scripts. 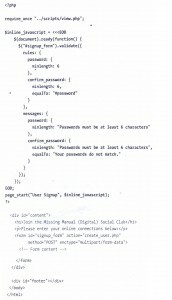 You need the wall, but you still need to let signin.php handle authentication. That’s not hard. Next, you. 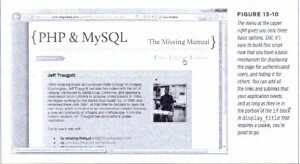 can add the require_once back in to show_user.php, show_users.oilp, and delete_. user.php. Test it. 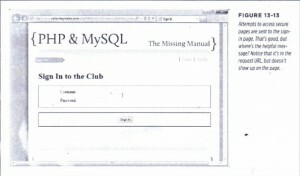 Make sure that you’re signed out (signout.php) via the menu link makes that a breeze now). 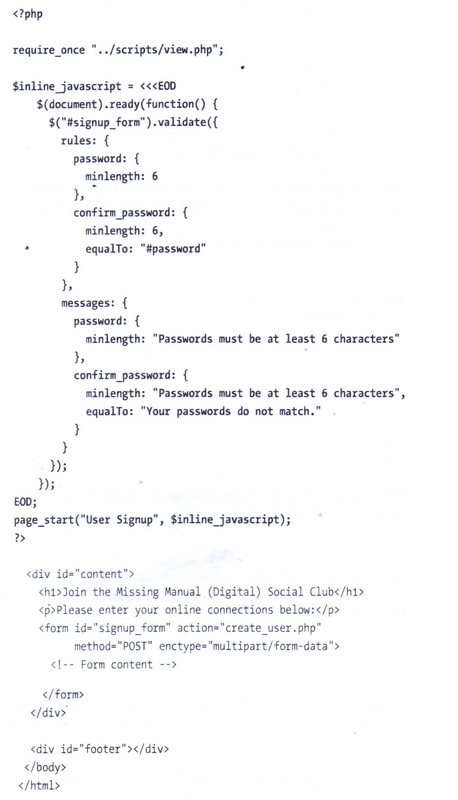 Then, try to access show_user.php: You see signs of progress, although things aren’t perfect yet. Figure 13-13is a good start, though. Go ahead and try things one more time. 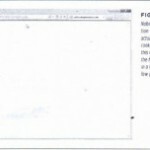 Go to snc» ..user ptv: without having a cookie, and you should see something like Figure 13-14. Take a quick breath and get ready for the home stretch: group-based authentication and the reason that cookies are cool, but maybe not your final authentication destination.